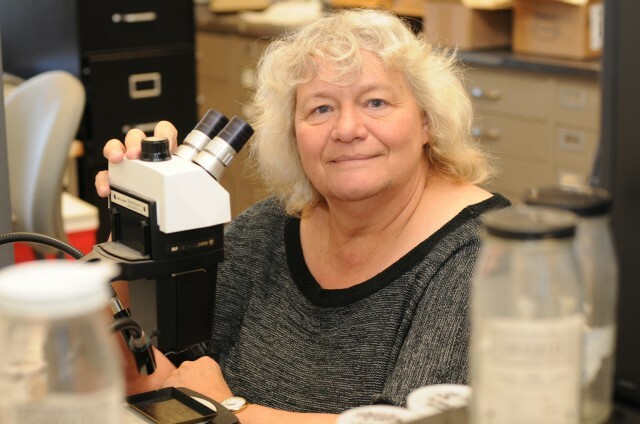 Ellen Thomas, research professor of earth and environmental sciences, has been awarded the Maurice Ewing Medal by the American Geophysical Union (AGU). The medal is one of the AGU’s most prestigious awards and will be presented to Thomas during the organization’s annual meeting later this year. According to AGU, “Jointly sponsored with the United States Navy, the Ewing Medal is named in honor of Maurice Ewing, who made significant contributions to deep-sea exploration.” It is presented each year for significant original contributions to the scientific understanding of the processes in the ocean; for the advancement of oceanographic engineering, technology, and instrumentation; and for outstanding service to the marine sciences. Among Thomas’ research areas is paleoceanography. She studies microscopic fossils in ocean beds and sediments that can provide clues to life and climate as it appeared on earth tens and often hundreds of millions of years ago. She is the recipient of several National Science Foundation and Keck grants. Her research has been published in Science, Geology, Oceanography, and the International Journal of Earth Sciences, among others. Michael Barsotti ’12, signed a contract to pitch for the minor league Joliet Slammers of the independent Frontier League. 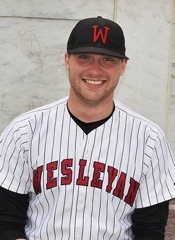 Barsotti, a government major, is Wesleyan’s all time strike-out leader. In his first appearance for Joliet he threw a scoreless inning in relief and did not allow a batter to reach base. On July 14, he was named the M&M Bank Player of the Game for the Slammers after inducing a ground out, a fly out and a pop out while throwing just nine pitches, seven of them strikes. Barsotti was twice named the NESCAC pitcher of the week during his Wesleyan career, including in March 2012 after throwing a three-hitter with 13 strikeouts, no walks and no earned runs allowed against Bowdoin, a team that went on to qualify for the NCAA Division III tournament. More on Barsotti can be found here. A recent USA Today piece cites Wesleyan’s new three-year bachelors degree option as an opportunity for students to save money, enter the workforce or graduate studies more rapidly, or both. The piece also links to President Roth’s guest blog in The Washington Post on the degree path. A piece in Time details briefly how this presidential campaign has turned sharply negative on both sides with virtually 90% or more of the ads coming from both President Obama and Mitt Romney taking a negative tone. Research by The Wesleyan Media Project was cited in the report. 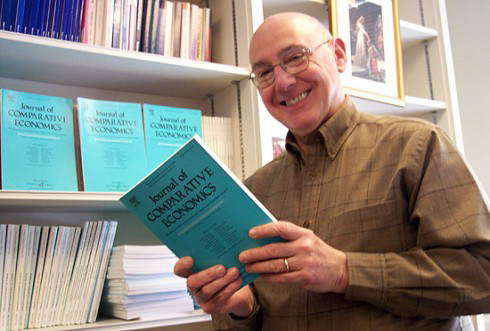 John Bonin, the the Chester D. Hubbard Professor of Economics and Social Science. In the midst of the banking crisis affecting the euro, John Bonin found himself in June offering banking advice to two countries that are members of the European Union, but have yet to join the monetary union linked by the euro. Romania is not yet in the European Monetary Union but its entry has been discussed during the last few years. Still it is likely linked to the European economy and Bonin’s presentation focused on the role of the six large international European banks in the Central and East European economies. Bonin shared the stage with Mugur Isarescu, the Governor of the National Bank of Romania, drawing extensive coverage from the Romanian and European news media. A PDF of the piece can be found here. CBS News reports that Seth Redfield, assistant professor of astronomy and Adam Jensen, visiting assistant professor of astronomy, have observed a planet the size of Jupiter called HD 189733b, which is about 63 light years from Earth–a virtual next-door neighbor in astronomical terms, that is dissolving, albeit very, very slowly. Redfield and Jensen have documented that HD 189733b, a gas giant, is discharging significant amounts of atomic hydrogen into space. They reported on this phenomenon in a paper titled “A Detection of Ha In An Exoplanetary Exosphere,” will appear in the June 1 issue of The Astrophysical Journal. 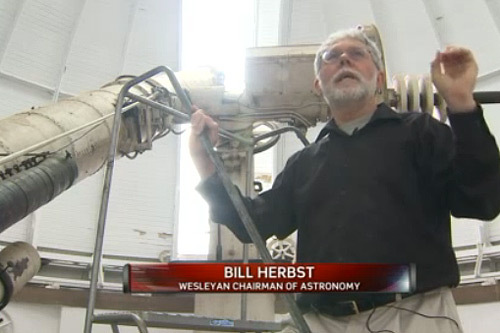 The Wesleyan Connection also ran a story about the discovery.